There’s nothing better than spending a night by the campfire. It’s the perfect spot to cozy up with s’mores, hot cocoa, or even some mulled wine. 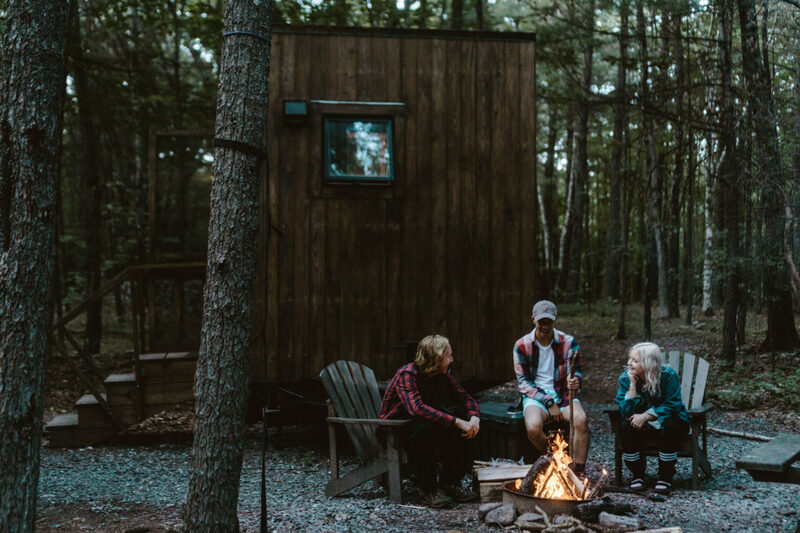 We’ve tried to make building a fire as easy as possible at Getaway, with log bundles and fire starters available for purchase and lighters placed in every cabin. If you’ve never built a fire before though, the task can seem pretty daunting. That’s why we’ve created a step-by-step guide for your convenience. First, you have to set up your wood. While there are many ways to do this, one popular method is called the teepee or the cone. Start with a handful of tinder (twigs, dry leaves, wood shavings, newspaper, etc.) and build a cone of kindling (small sticks or pieces of wood) around it. Be sure your supplies are dry for the best chances at starting a fire. Once the fire is lit, you can add larger logs around the cone as needed. Next, you need to light your fire. Use waterproof matches or a lighter on the tinder to start the blaze. The fire needs oxygen to burn, so blow air on its base to help increase the flame, and add more logs as needed. While we all love campfires, we also need to keep fire safety in mind. Before you leave the fire pit, make sure your fire is completely extinguished. Add water to the fire and stir the ashes until they are cool to the touch. Lastly, remember to take care of the area around the campfire. Remove any plastic or other trash nearby and be sure to keep your campfire within the provided fire pit.